This was our tenth cruise and second with Oceania. We were on the Riviera last year and had a wonderful time. Much to our delight this cruise was even better than the previous one. For us, as good as the ship itself was and all it had to offer, the best part of the cruise was the people. We met so many amazing people on this cruise and had a delightful time with them from the minute we boarded to the moment we left. We’ve been on the big ships in the past, but we much prefer the size of the Riviera. We find it&apos;s a little more intimate, with a sense of community when the ship is not a floating mega-city! Also, and I don’t mean to sound like a stuffy snob, but the type of people that cruise with Oceania appeal much more to our age and tastes than some of the other cruise lines. As so many others have noted, the food is outstanding from the main dining room to the specialty restaurants to the Terrace Café buffet. The buffet selection was as good as any of the other restaurants. Beyond the buffet&apos;s amazing selection, what also appealed to us about the buffet was that we don’t touch the food – it is served to us and as a result it is so much healthier. Speaking of healthy, we loved the fact that every morning we could get fresh veggie juice just like we have at home. In all the restaurants there were all sorts of healthy eating alternatives. The room was cozy but large enough. The storage space was adequate. Of course, we loved the balcony where we spent a lot of time enjoying our books and having a drink and taking in the gorgeous views. Even the bathroom was great. It was roomy and we loved having a tub. As for the entertainment, we’re not big on the song and dance shows, but we do love comedy, and on this cruise standup comedian Tom Drake was featured. He did two hysterically funny shows as well as a workshop on comedy. We were very happy with the ports we went to this year. The ports were Aruba, Bonaire, Grenada, Barbados, St. Lucia, St. Kitts and St. Barts. The stays in the ports for the most part were all day so we never felt rushed. Most of the excursions we chose were good – some better than others. St. Kitts was probably our favourite. We loved the beach and the drive there was breathtaking at times. Beach day at Aruba was great. We visited a lovely beach with lots of shade which we appreciated, and there was very good snorkelling there. We not impressed with the Spice Beach club excursion on Bonaire. It wasn’t much of a beach, but the snorkelling was good. There was only one port we didn’t visit, St. Barts, because we would have had to tender there. We don’t like the tenders that Oceania use. They use their lifeboats, and they are just too rocky. We had a bad experience on one last year and decided to avoid it this year. 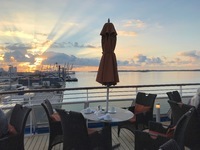 We found more than enough to do on board – trivia, miniature golf, shuffleboard, cooking lessons, (okay we’re 65, what do you expect!!) The staff was top notch. Everyone from our cabin attendants to the severs in the restaurants to everyone else on board were helpful, courteous and friendly. I should also point out that on this cruise we had the best cruise director ever. Her name was Dottie and she was by far the best Cruise Director we have come across in our ten cruises. She connected with the guests so perfectly. She was always bubbly, funny and just downright nice. Embarkation and debarkation was unbelievably smooth and quick. We hope to go on another Oceania cruise next year. We understand that the Riviera is going to be getting a little refurbishing. We did see some people complaining in previous reviews that the ship looked a little worn. We thought the ship was totally charming. We had no complaints about the appearance or performance of the ship. Hopefully we&apos;ll see what is new next year. This was our tenth cruise and second with Oceania. We were on the Riviera last year and had a wonderful time. Much to our delight this cruise was even better than the previous one. For us, as good as the ship itself was and all it had to offer, the best part of the cruise was the people. We met so many amazing people on this cruise and had a delightful time with them from the minute we boarded to the moment we left. We’ve been on the big ships in the past, but we much prefer the size of the Riviera. We find it&apos;s a little more intimate, with a sense of community when the ship is not a floating mega-city! Also, and I don’t mean to sound like a stuffy snob, but the type of people that cruise with Oceania appeal much more to our age and tastes than some of the other cruise lines. As so many others have noted, the food is outstanding from the main dining room to the specialty restaurants to the Terrace Café buffet. The buffet selection was as good as any of the other restaurants. 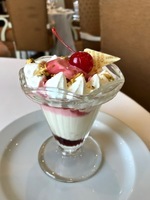 Beyond the buffet&apos;s amazing selection, what also appealed to us about the buffet was that we don’t touch the food – it is served to us and as a result it is so much healthier. Speaking of healthy, we loved the fact that every morning we could get fresh veggie juice just like we have at home. In all the restaurants there were all sorts of healthy eating alternatives. The room was cozy but large enough. The storage space was adequate. Of course, we loved the balcony where we spent a lot of time enjoying our books and having a drink and taking in the gorgeous views. Even the bathroom was great. It was roomy and we loved having a tub. As for the entertainment, we’re not big on the song and dance shows, but we do love comedy, and on this cruise standup comedian Tom Drake was featured. He did two hysterically funny shows as well as a workshop on comedy. We were very happy with the ports we went to this year. The ports were Aruba, Bonaire, Grenada, Barbados, St. Lucia, St. Kitts and St. Barts. The stays in the ports for the most part were all day so we never felt rushed. Most of the excursions we chose were good – some better than others. 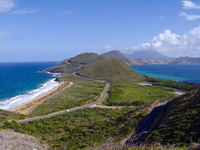 St. Kitts was probably our favourite. We loved the beach and the drive there was breathtaking at times. Beach day at Aruba was great. We visited a lovely beach with lots of shade which we appreciated, and there was very good snorkelling there. We not impressed with the Spice Beach club excursion on Bonaire. It wasn’t much of a beach, but the snorkelling was good. There was only one port we didn’t visit, St. Barts, because we would have had to tender there. We don’t like the tenders that Oceania use. They use their lifeboats, and they are just too rocky. We had a bad experience on one last year and decided to avoid it this year. The staff was top notch. Everyone from our cabin attendants to the severs in the restaurants to everyone else on board were helpful, courteous and friendly. I should also point out that on this cruise we had the best cruise director ever. Her name was Dottie and she was by far the best Cruise Director we have come across in our ten cruises. She connected with the guests so perfectly. She was always bubbly, funny and just downright nice. Embarkation and debarkation was unbelievably smooth and quick. We hope to go on another Oceania cruise next year. We understand that the Riviera is going to be getting a little refurbishing. We did see some people complaining in previous reviews that the ship looked a little worn. We thought the ship was totally charming. We had no complaints about the appearance or performance of the ship. Hopefully we&apos;ll see what is new next year. Not much of a beach. The chairs were filthy and there was very little shade. St. Lucia is beautiful, but the snuba was only so-so.